In a setback to the Gujarat government, the Gujarat High Court has set aside the state police decision to bar farmers of the prestigious Dholera Special Investment Region (SIR) from taking out a six-day long padyatra or footmarch to oppose the proposal of smart city in the largely rural area. The foot march was to begin on Thursday. Smart city in Dholera is one of the proposals floated by Prime Minister Narendra Modi when he was Gujarat chief minister. It is one of the most important projects envisaged by him. Upcoming farmers' organization Khedut Samaj - Gujarat (KSG) leader Sagar Rabari said, the High Court has "directed" the farmers' organization to reschedule its programme, as pending High Court hearing, the padyatra could not start. The foot march was to begin in Bavaliyari village of Dholera SIR with the participation of 100 persons and end on November 3 in front of the Ahmedabad district collector's office, where the farmers' leaders were to submit an application seeking beginning of hearing for regularizing farmers' landownership rights. 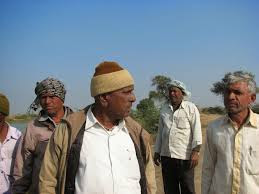 A large number of poor farmers of Dholera SIR, who were allocated land during the land reforms days in the 1960s, have still not become the rightful owners of the land they have been tilling for decades. Meanwhile, the Gujarat government declared about 28,503 hectares (ha) of land, mainly belongng to these farmers, as government-owned. The poor farmers, meanwhile, are now being orally told that the lands they were tilling did not belong to them but had been transferred to the Dholera SIR Authority in order to implement the smart city project. Ironically, the district collector, Ahmedabad, had promised to begin land kacheris (hearings) in each of the 22 villages of Dholera SIR at the Environmental Public Hearing (EPH), held on January 3, 2014, in order to regularize the landownership. The land kacheris have still not been held. Rabari said, following the High Court order, the KSG, in consultation with the local farmers' organization, Bhal Bachao Samiti, would "meet soon and declare new dates." Well-known High court advocate Anand Yagnik, who argued for the farmers, referring to several court judgements, and said that the state goverment or the police had "no right to prevent the farmers from expressing their grievances against the government's decision." Yagnik wondered how could the Gujarat police allow half-a-million Patels to march in Ahmedabad on August 25, while it was denying permission to about 100 farmers taking out padyatra from one village to another. The Gujarat police, while refusing permission, cited reasons like forthcoming Diwali festivals and dangers to law and order due to lack of police force. Rabari said, the obstacle in starting padyatra had been "created by the Gujarat government" in order to "restrain the farmers of the state from voicing their grievances", which reflected its "anti-rural and anti-farmer mindset". Calling the state government move "greatly disappointing" to the farmers of Dholera SIR, he added, "The people of the area are extremely angry with the deployment of a huge police force, police jeeps and trucks, and water cannons all over." Terming this "the government’s strong resolve to crush the farmers", Rabari said, "They are more enraged and disillusioned by the government’s discrimination against them." While there is "over-enthusiasm to welcome the corporates", the government is "turning a deaf ear" to the farmers' issues.